This Pink Ballerina Cake was inspired by M Vieira’s beautiful ballerina cake on this website. It was quite easy to make, although it did take some time. The cake itself is two Devil’s Food cake mixes baked in a Wilton professional grade 10-inch wide x 3-inch deep pan. The baking itself took about an hour in a 325 degree oven. 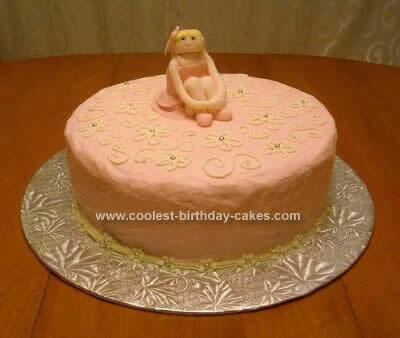 After slicing off the top and torting into two layers, the cake was filled and iced smooth with pink icing. The flowers, Swirlies etc. were piped using a no.3 round tip, and the bottom edging was done using star and small flower tips. Silver dragees were used as flower centers throughout. The ballerina was free-formed using Wilton premade fondant icing and the tiniest amounts of pink, peach and yellow icing colour. The eyes were poked in using a spaghetti noodle, and then coloured blue using the same noodle dipped in blue icing colouring. I note that the spaghetti noodle was also used to join the head, neck and body on the ballerina. The ballerina was the hardest part, but it was good to have a back up plan in place involving a purchased figurine (not bought, but sourced) if things didn’t work out with the sculpting.